In yesterday's post, "Limbaugh Lower Now, How Low Can You Go...," we ended the piece saying, "Us against them. The People vs. the Elites. That's what you use to be the leader of a mass movement. 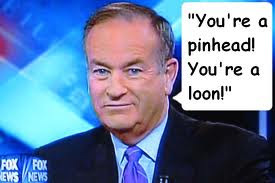 With a few rhetorical skills, you can be as rich as the Rushbo. He may be losing his sponsors, and ultimately his job, but he already has enough money to finance a thousand trips to Haiti," and we promised that we would talk about the links between propaganda, populism, and charisma, so that you too can be a left-wing propagandist as we show your everything you need to know about propaganda. At the very least, you'll be prepared to recognize the classic forms of propaganda when your Conservatives start repeating the memes their favorite propagandist spews forth every day. "1. PROPAGANDA - a simple definition Propaganda is that which is sent from one individual to another and is not true when taken as a whole. "Goebbels insisted that Nazi propaganda be as accurate as possible. 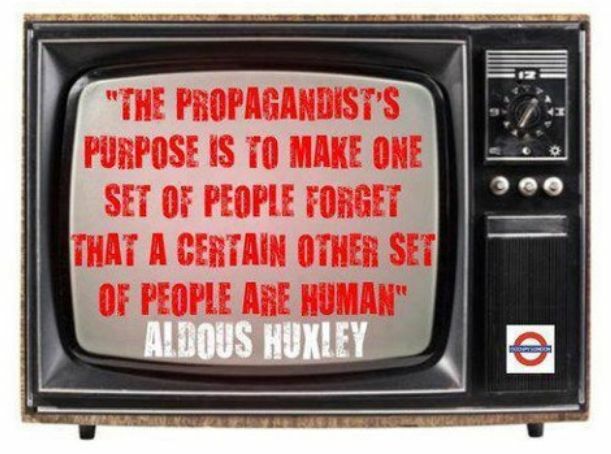 That is very interesting, because people think of propaganda as nothing but a pack of lies. Because propaganda is often true, at least to a degree, people more easily succumb to it. 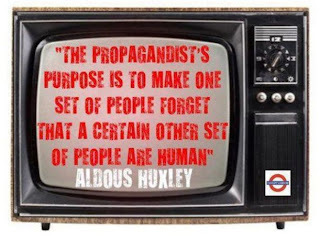 "The term 'propaganda' embraces the following: psychological action, psychological warfare, reeducation and brainwashing, public and human relations, and advertising. "1. Example: 'Communist propaganda' The very term is propaganda. It creates the myth that anything a communist says is propaganda. It also implies that anything non-communists say is not propaganda. "2. Example: 'Marlboro cigarettes' One cannot think about Marlboro cigarettes without thinking of cowboys and the American west. And yet they are manufactured on the east coast. Tobacco isn't grown in the west. It is likely that most people who buy them are not cowboys. The image is nothing more than a created myth that is artificially associated with this brand. "1. If you ever saw propaganda that seemed ridiculous to you, chances are that it didn't work because you didn't want it to work. Remember the Ford Mustang ad where the lonely accountant buys a Mustang, and suddenly girls chase him down the street? Nobody thinks that will happen, right? Well, sales of Mustangs went up in correlation to the ad campaign. "Education is a prerequisite for propaganda. "Students are inadvertently conditioned to be receptive to propaganda by their schools. How can this be? "1. Students absorb large quantities of second-hand, unverifiable information. "2. Students are made to feel that they should have an opinion on every important question. Most of these issues are very complex, so the student falls prey to the propaganda of those whom they trust. "3. Students feel capable of judging the merits of these opinions for themselves. In most cases they haven't learned how to evaluate these opinions. "It is not that schools are evil. It is an unintended byproduct of the system. The real problems come when the student leaves school (italics ours). Other sources of propaganda become the 'teacher.' The student applies the same principles of school to other media, such as the television, radio, magazines, and so forth. The three things listed above happen to every student in every type of school. And almost every person has gone to school. So almost every member of modern society is conditioned by the school to be receptive to propaganda. "1. Total propaganda is a phenomenon which takes place when all the media act together and bring about a complete change in perspective of the weltanschauung (paradigm) of the society. Almost no one disagrees with the belief. In fact, few people are even aware that they have the belief. "1. Vertical propaganda is that which comes directly from the source to the target audience. It is analogous to lightning striking the ground. Examples are any advertisement, a campaign speech given by the candidate, press releases from political action groups. "2. Horizontal propaganda takes place when the vertical propaganda has taken hold among a few members of the target audience. It then spreads among the group, either by word of mouth or by example. It is analogous to a fire spreading from the point of the lightning strike. This is the bandwagon effect. "3. Both vertical and horizontal propaganda are needed for the propaganda to be effective. "1. Propaganda also serves to reinforce beliefs. For instance, people who listen to Rush Limbaugh are mostly those who already agree with his perspective. His function is to help maintain and strengthen the beliefs of the converted. 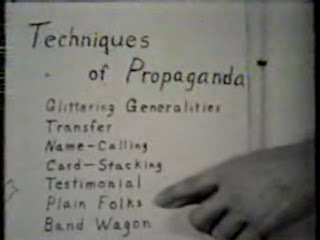 "There are many techniques commonly used in the dissemination of propaganda. "BANDWAGON: The basic idea behind the bandwagon approach is just that, 'getting on the bandwagon.' The propagandist puts forth the idea that everyone is doing this, or everyone supports this person/cause, so should you. The bandwagon approach appeals to the conformist in all of us: No one wants to be left out of what is perceived to be a popular trend. "EXAMPLE: Everyone in Pukatawagan is behind Dan George for Chief. Shouldn't you be part of this winning team? millions, of people to become supporters. "EXAMPLE: 'Sam Slugger', a baseball Hall of Famer who led the pros in hitting for years, appears in a television ad supporting Mike Politico for U.S. Senate. Since Sam is well known and respected in his home state and nationally, he will likely gain Mr. Politico many votes just by his appearance with the candidate. "PLAIN FOLKS: Here the candidate or cause is identified with common people from everyday walks of life. The idea is to make the candidate/cause come off as grassroots and all-Canadian. "EXAMPLE: After a morning speech to wealthy Liberal donors, Jean Chretien stops by McDonald's for a burger, fries, and photo-op. "TRANSFER: Transfer employs the use of symbols, quotes or the images of famous people to convey a message not necessarily associated with them. In the use of transfer, the candidate/speaker attempts to persuade us through the indirect use of something we respect, such as a patriotic or religious image, to promote his/her ideas. Religious and patriotic images may be the most commonly used in this propaganda technique but they are not alone. Sometimes even science becomes the means to transfer the message. "EXAMPLE: The environmentalist group PEOPLE PROMOTING PLANTS, in its attempt to prevent a highway from destroying the natural habitat of thousands of plant species, produces a television ad with a 'scientist' in a white lab coat explaining the dramatic consequences of altering the food chain by destroying this habitat. 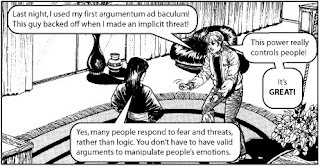 "FEAR: This technique is very popular among political parties and PACs (Political Action Committees) in the U.S. The idea is to present a dreaded circumstance and usually follow it up with the kind of behavior needed to avoid that horrible event. "EXAMPLE: The Citizens for Retired Rights present a magazine ad showing an elderly couple living in poverty because their social security benefits have been drastically cut by the Liberals. The solution? The CRR urges you to vote for Conservatives. 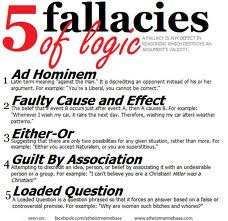 "LOGICAL FALLACIES: Applying logic, one can usually draw a conclusion from one or more established premises. In the type of propaganda known as the logical fallacy, however, the premises may be accurate but the conclusion is not. "Premise 1: The Prime Minister supports gun control. "Premise 2: Communist regimes have always supported gun control. "Conclusion: The Prime Minister is a communist. "We can see in this example that the Conclusion is created by a twisting of logic, and is therefore a fallacy. 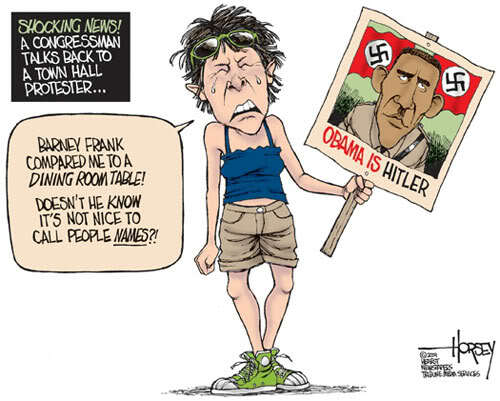 "NAME-CALLING: This is the opposite of the GLITTERING GENERALITIES approach. Name-calling ties a person or cause to a largely perceived negative image. "EXAMPLE: In a campaign speech to a logging company, a Member of Parliament referred to his environmentally conscious opponent as a 'tree hugger.'" "Propaganda has been around for many centuries, although the term itself wasn't coined until Pope Gregory XV established the Congregation of Propaganda in 1622. The pope created this group for the express purpose of trying to win back Catholics who'd taken up the Protestant faith during the Reformation. Missionary work was nothing new, of course, but people began to realize the possibilities associated with "spreading the word." The technique became widely used not only for religious conversions but also for political and wartime public persuasion purposes. "Card stacking is the presentation of only the details, statistics and other information that impacts public opinion positively. In other words, the bad stuff is left out entirely. 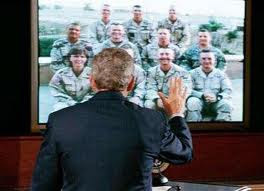 Experts maintain that although the information that's presented is usually true, this type of propaganda technique presents a lopsided and unrealistic viewpoint that is dangerously deceptive. Card stacking is often used in political campaign advertisements." "The name-calling technique links a person, or idea, to a negative symbol. The propagandist who uses this technique hopes that the audience will reject the person or the idea on the basis of the negative symbol, instead of looking at the available evidence. 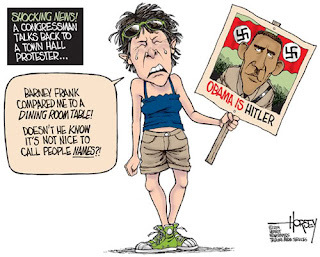 "The name-calling technique was first identified by the Institute for Propaganda Analysis (IPA) in 1938. According to the IPA, we should ask ourselves the following questions when we spot an example of name-calling. "What does the name mean? "Does the idea in question have a legitimate connection with the real meaning of the name? "Is an idea that serves my best interests being dismissed through giving it a name I don't like? "Leaving the name out of consideration, what are the merits of the idea itself? "For our purposes in propaganda analysis, we call these virtue words 'Glittering Generalities' in order to focus attention upon this dangerous characteristic that they have: They mean different things to different people; they can be used in different ways. "This is not a criticism of these words as we understand them. Quite the contrary. 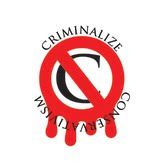 It is a criticism of the uses to which propagandists put the cherished words and beliefs of unsuspecting people. "What does the virtue word really mean? "Is an idea that does not serve my best interests being "sold" to me merely through its being given a name that I like? "Leaving the virtue word out of consideration, what are the merits of the idea itself? "When propagandists use glittering generalities and name-calling symbols, they are attempting to arouse their audience with vivid, emotionally suggestive words. In certain situations, however, the propagandist attempts to pacify the audience in order to make an unpleasant reality more palatable. This is accomplished by using words that are bland and euphemistic. "The comedian George Carlin notes that, in the wake of the first world war, traumatized veterans were said to be suffering from 'shell shock.' The short, vivid phrase conveys the horrors of battle -- one can practically hear the shells explodingoverhead. After the second world war, people began to use the term "combat fatigue" to characterize the same condition. The phrase is a bit more pleasant, but it still acknowledges combat as the source of discomfort. In the wake of the Vietnam War, people referred to 'post-traumatic stress disorder': a phrase that is completely disconnected from the reality of war altogether. "Tiger Woods is on the cereal box, promoting Wheaties as part of a balanced breakfast. Cher is endorsing a new line of cosmetics, and La Toya Jackson says that the Psychic Friends Network changed her life. The lead singer of R.E.M appears on a public service announcement and encourages fans to support the 'Motor Voter Bill.' The actor who played the bartender on Cheers is an outspoken environmentalist. "This is the classic misuse of the Testimonial Device that comes to the minds of most of us when we hear the term. We recall it indulgently and tell ourselves how much more sophisticated we are than our grandparents or even our parents. "There is nothing wrong with citing a qualified source, and the testimonial technique can be used to construct a fair, well-balanced argument. However, it is often used in ways that are unfair and misleading. "The most common misuse of the testimonial involves citing individuals who are not qualified to make judgements about a particular issue. In 1992, Barbara Streisand supported Bill Clinton, and Arnold Schwarzenegger threw his weight behind George Bush. Both are popular performers, but there is no reason to think that they know what is best for this country. "Unfair testimonials are usually obvious, and most of us have probably seen through this rhetorical trick at some time or another. However, this probably happened when the testimonial was provided by a celebrity that we did not respect. When the testimony is provided by an admired celebrity, we are much less likely to be critical. "According to the Institute for Propaganda Analysis, we should ask ourselves the following questions when we encounter this device. "Who or what is quoted in the testimonial? "Why should we regard this person (or organization or publication) as having expert knowledge or trustworthy information on the subject in question? "What does the idea amount to on its own merits, without the benefit of the Testimonial?You may have noticed the presence of the testimonial technique in the previous paragraph, which began by citing the Insitute for Propaganda Analysis. In this case, the technique is justified. Or is it?" 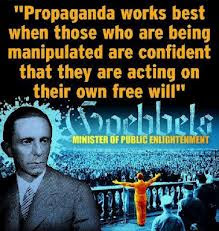 Propaganda has been studied by the Rush Limbaughs of the American right-wing politicians and put to evil use, but as in wartime, propaganda should be used by non-Conservatives to compete on a level playing field with the Conservative criminals and their mouthpieces and front groups. I have my own definitions on propaganda and the ways it works but I do appreciate all you have written for others on the matter. People need to learn about all you have written on the matter.